By crowdfunding for Get my Grades on rocket Fund, you have access to a subscription at £500 per class (for up to 35 students) which is a discount of 35% compared to buying a subscription for each class individually directly. Automated collection of data so that everyone knows how a student is doing and what grade they're on track to achieve. Get My Grades is the single platform allowing everyone to access quality online content, set effective revision and track student progress. With a transferable curriculum, it even allows student data to follow them through their school career - so that a student's work and data in Year 7 is available to their teacher at the start of Year 8 and can continue to provide insights for what they'll find easier or more difficult at GCSE. 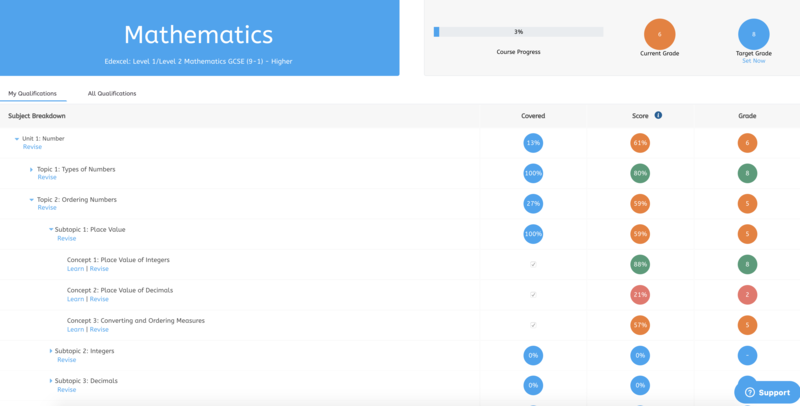 Get My Grades is the ultimate learning platform: quality content, realistic questions and automatic tracking. For more info, visit the Get My Grades website here. Access the quality online content to learn anywhere, anytime and on any device - written by expert educators and based on the latest educational research. Complete realistic practice questions, mapped to their course, based only on the topics that have been covered - and get detailed feedback and comments from their teacher. See what content is on their course, how much has been covered and where their strengths and weaknesses lie. Give your students access to a growing bank of quality content and varied questions, mapped to a range of courses: 850+ pages and 75,000+ questions for English and Maths alone! Encourage student self-assessment to build metacognitive skills - and a sense of responsibility and ownership. Save time on marking without relying on multiple choice questions! No more data entry! Have meaningful data on student progress collected automatically, including when students complete assignments, how well they do and how long they take. See the content on their child's course - mapped to their qualification and exam board. No need for additional revision guides. Easy to see how well their child is doing in each subject, giving unprecedented detail on where they're doing well and need help. Know how much of the course is covered and their grades. It's easy to set their child meaningful additional practice, helping to prepare them for the new, more challenging, reformed GCSEs. *For unusual sized classes or a price per student, please contact Get My Grades. SPECIAL: For the 2018/19 Academic Year only: join the Research Partners Programme for just £250 per class per year! Conditions apply.